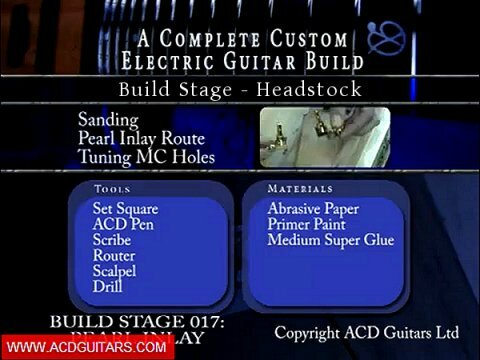 If a picture tells a thousand words then this page should help some of you who are just getting started with inlays. Remember that we all learn the hard way so do not feel too bad if things don't go right the first time. 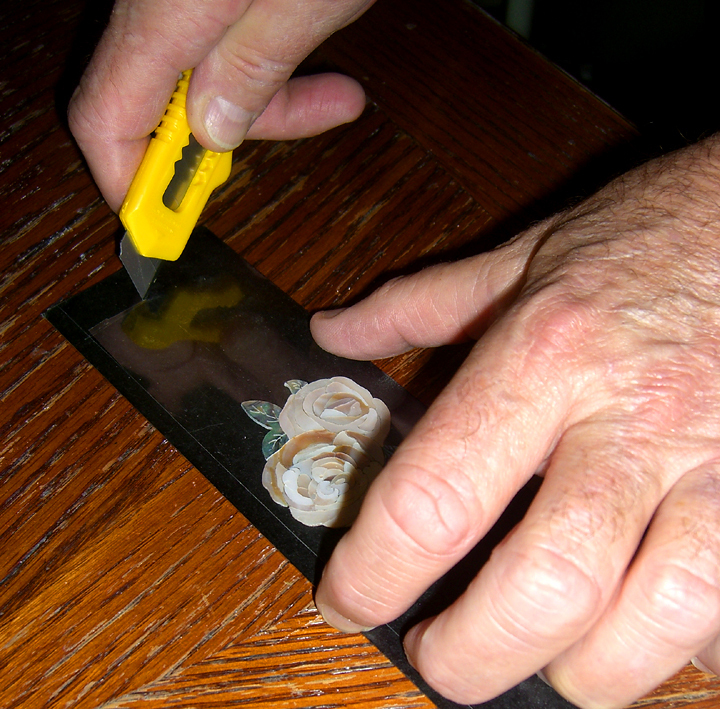 The first thing we need to know is how to transfer the pre-cut inlays from the mounting board to the instrument. 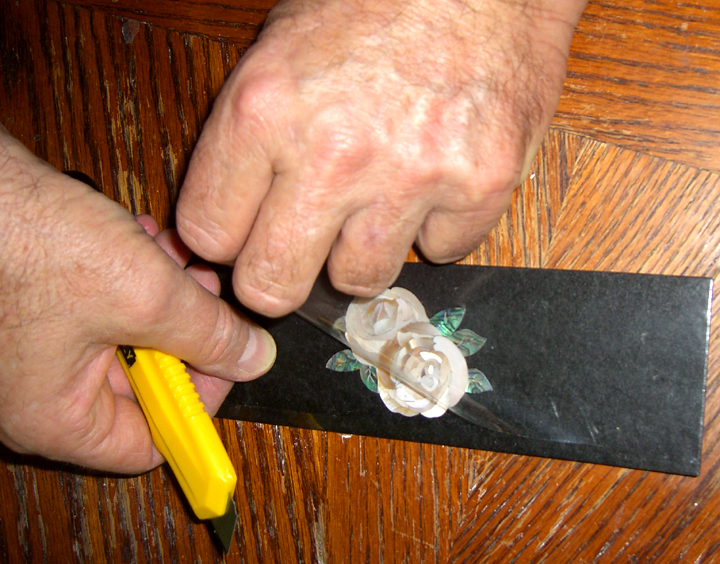 Never try to pry the inlays off the board because they can be quite fragile and may break. 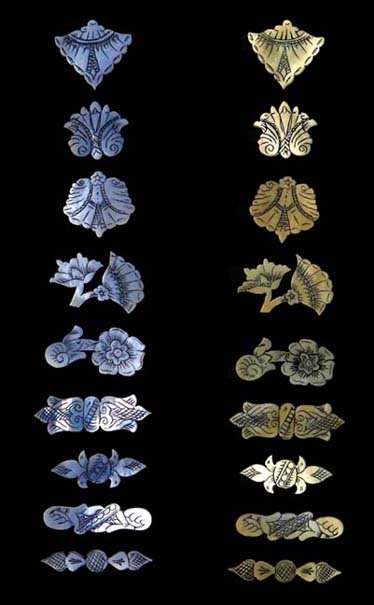 You need to soak them off in hot water until they release from the mounting board. They have been glued onto that board with water based glue so hot water will get them off easy. One of our customers soaked them (The Celtic Rosette) off without going through all the steps and ended up with this mess. I was a little to blame because I didn't tell him how to do this the right way. He also did not think to ask me. He was kind enough to allow me to use his picture (above), but we will keep his name a secret. I replaced the inlays for him because I am a softy and he deserved to get what he paid for. If you follow the steps shown below all should go very well and you will not feel like a dunce. I often do feel like an old fool. Always try to take your time. Do not rush. Keep your work well lit and try to know when to have a coffee break. 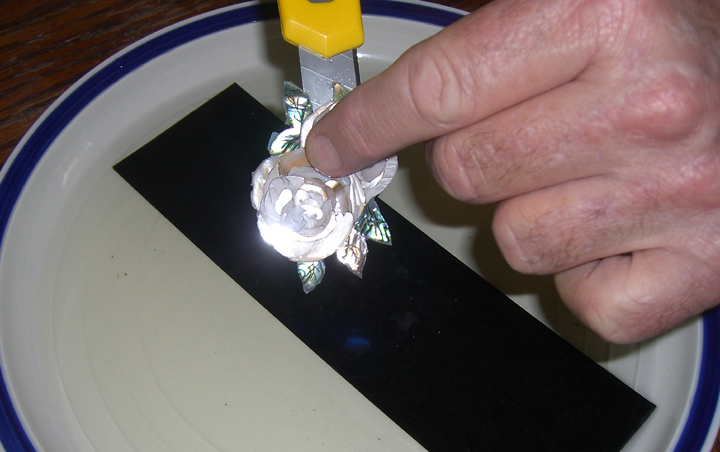 When you Buy pre-cut inlays from us this is most often how you will receive them. 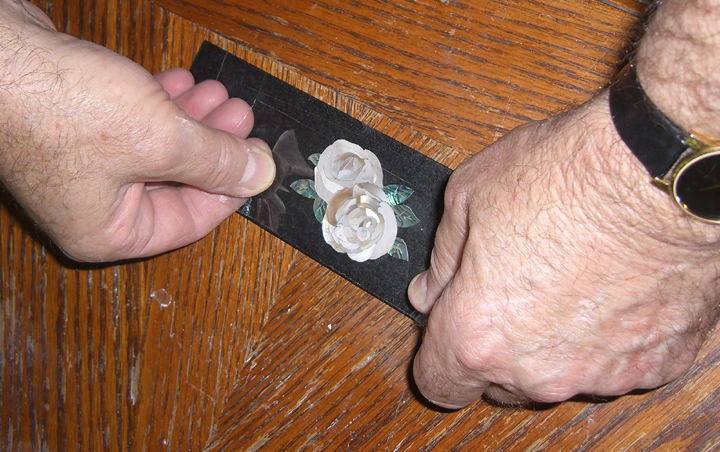 They are mounted on cardboard with a water based glue like Elmer's School Glue. NEVER EVER try to pry thee inlays off the board. They are delicate and can be broken. 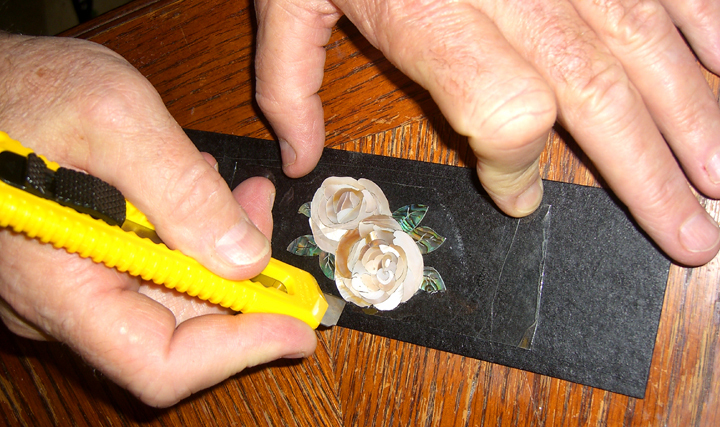 Cut away the shrink wrap being careful to look for any sections of inlay that may have come loose. before you try to remove it. 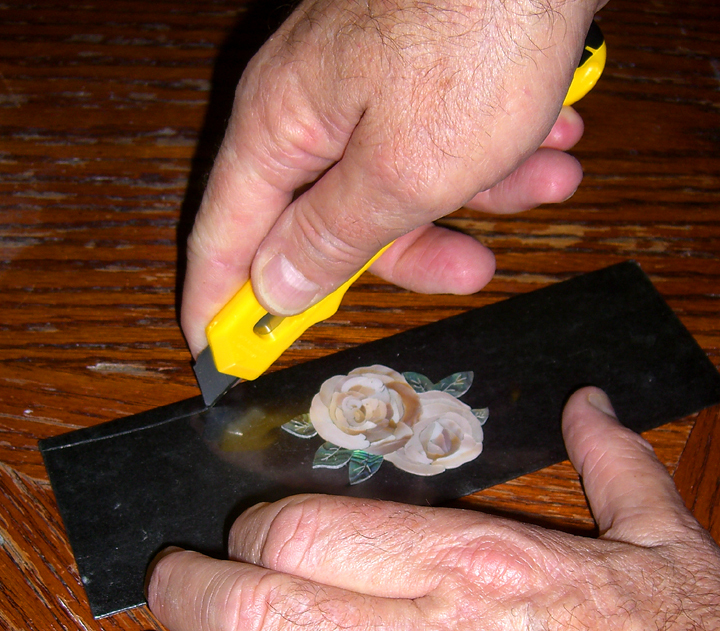 Press the tape down firmly onto every section of the shell inlay. 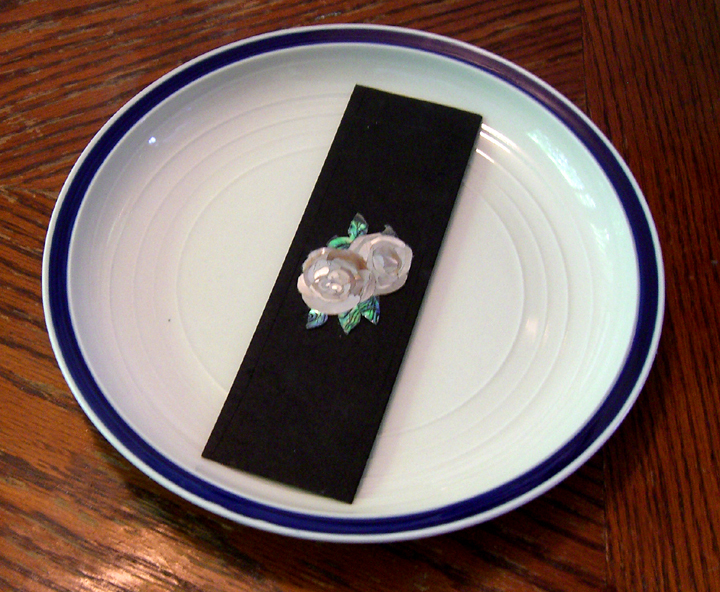 This will keep the inlay together so it will be almost like working with a single shell blank. 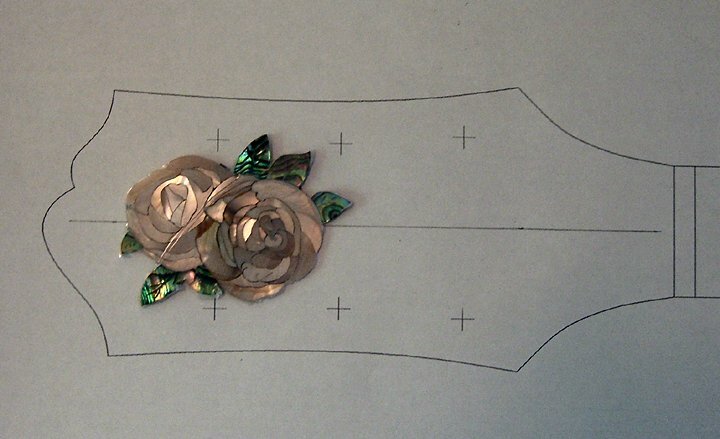 This Rose Inlay #2 has more than 45 sections of shell. 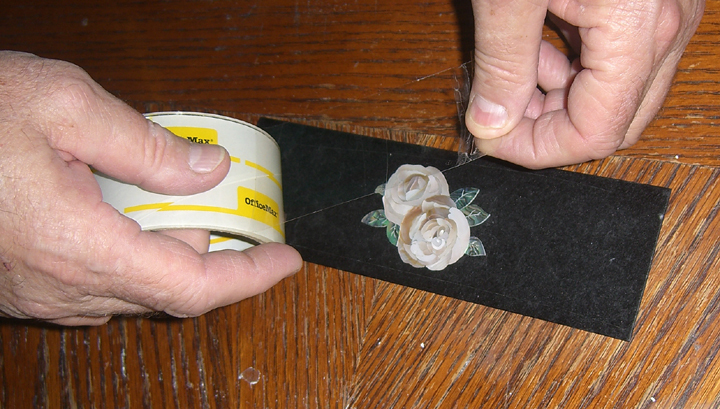 Use a sharp knife to trim away the excess tape. 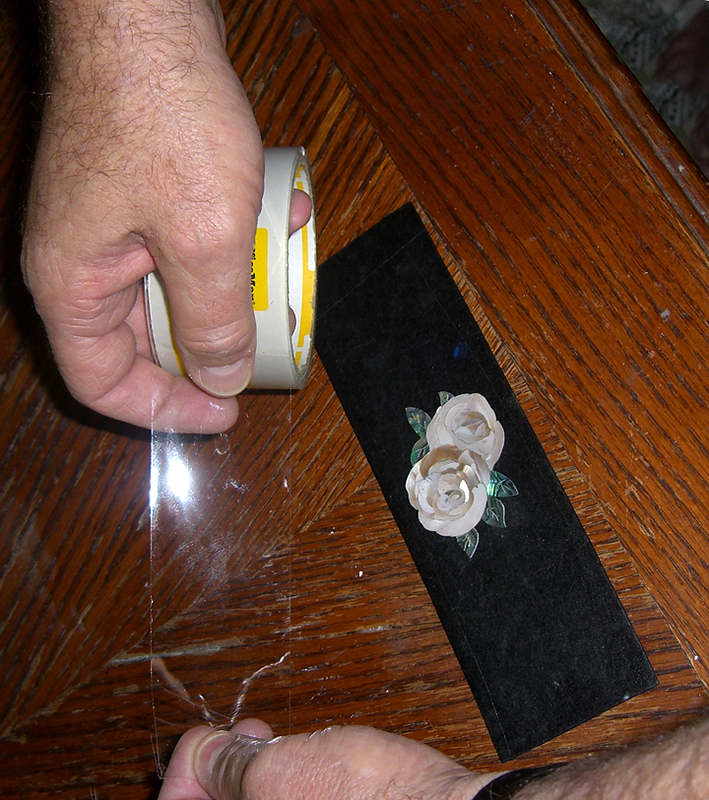 Remove the excess tape from the board. 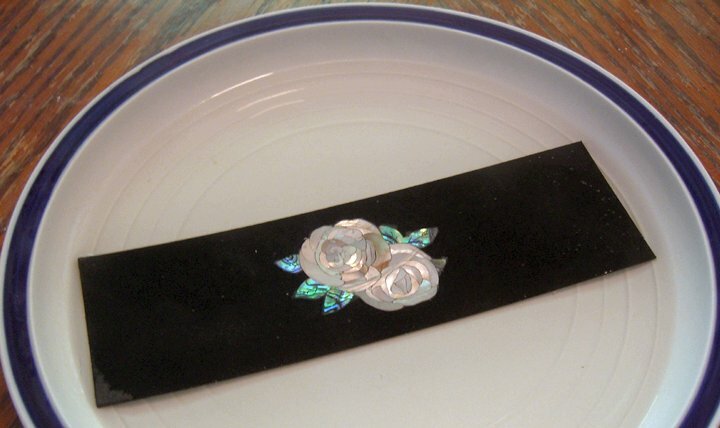 Place the inlay and board into a dish or other pan. 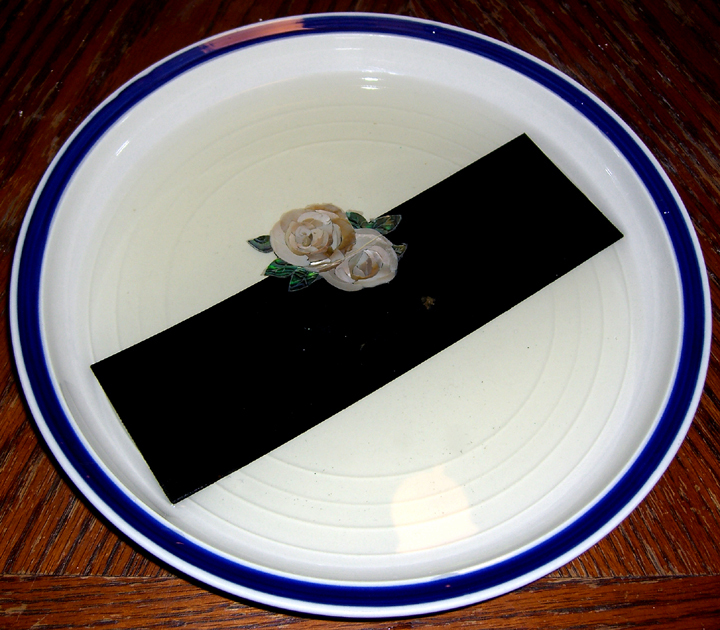 Pour very hot water over the inlay until it is covered. 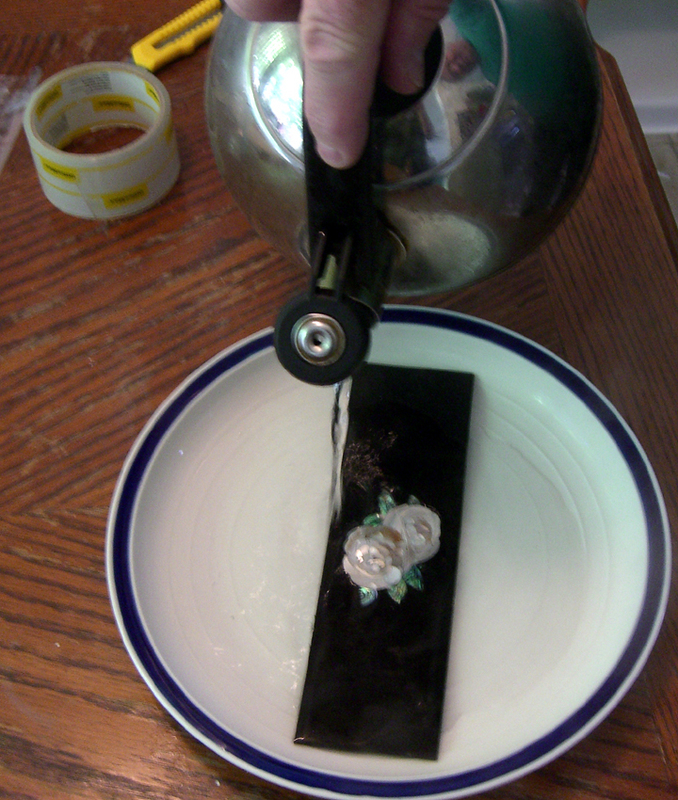 Let it sit in the hot water for 15 to 30 minutes until the inlay floats free without any effort. Remove the inlay. Rinse it to remove all the glue and dry with a towel. 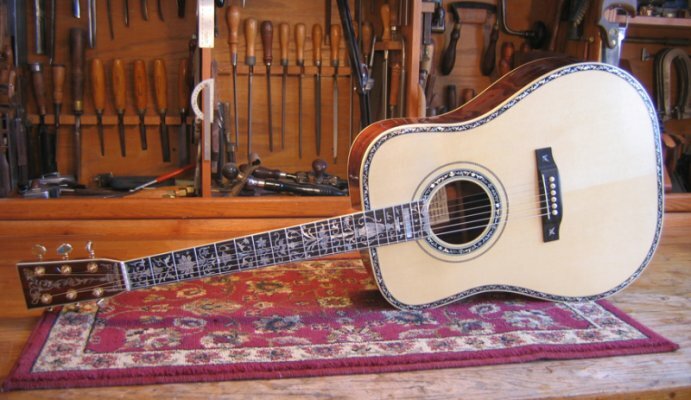 Lay the inlay on the instrument and position it where it is to be inlaid. I am using a “Paper Virtual” instrument so you can see well what should be done. 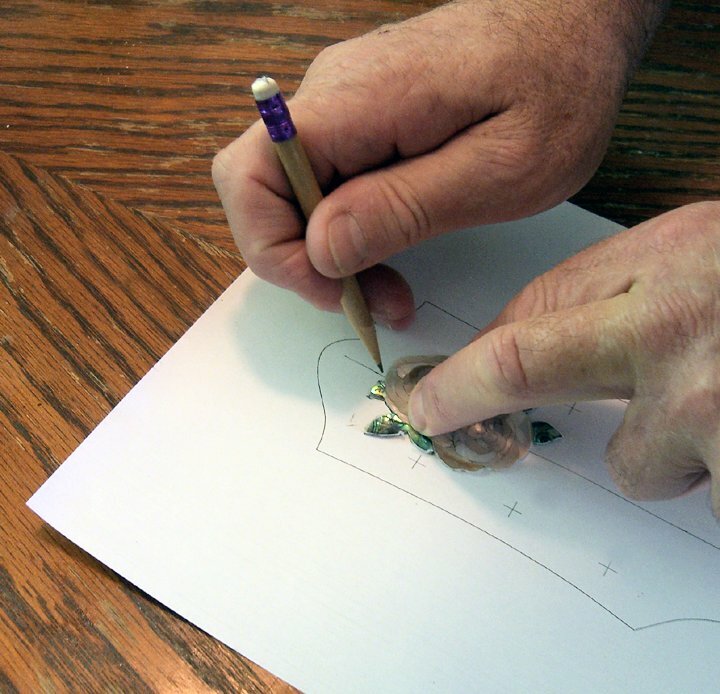 Use a very sharp pencil or scribe to mark the outside edges of the outline of the inlay. Do this while holding it down with your thumb. 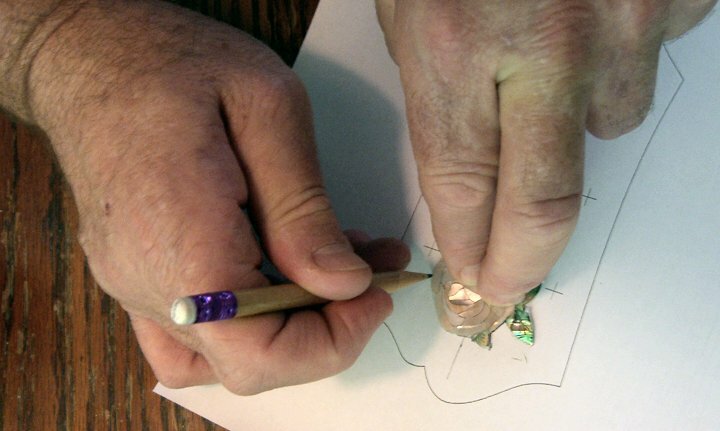 Some people like to spot glue the inlay in place while they do this. I prefer not to have to pry it off after, so I just hold it down. 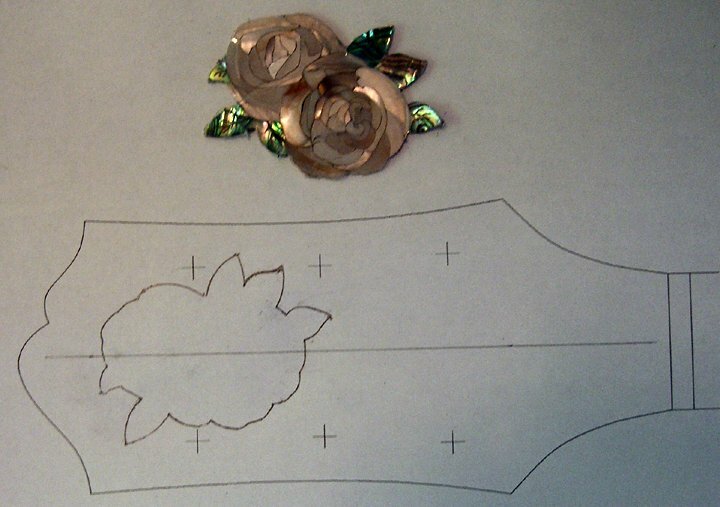 As you can see the outline is now ready to start your routing for the pocket the inlay will go into. inlay two guitars with the Harwood Set. 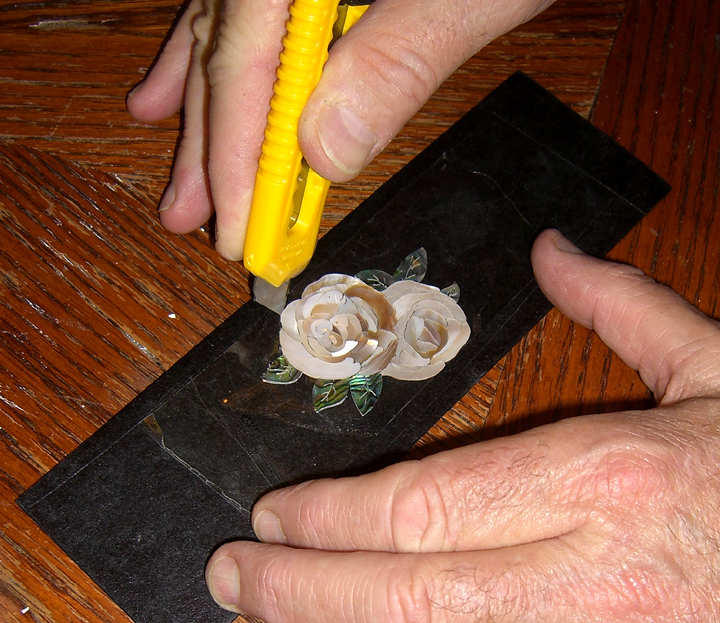 Because I no longer have a workshop, Paul Knee has helped in this part to show how the inlay is done. Paul Knee with my Acoustic Bass Guitar that he has finished for me. Click picture to see more of Paul's work. These Fairbanks Pre-Engraved inlays must be inlaid flush with the surface. Not an easy project for a beginner. 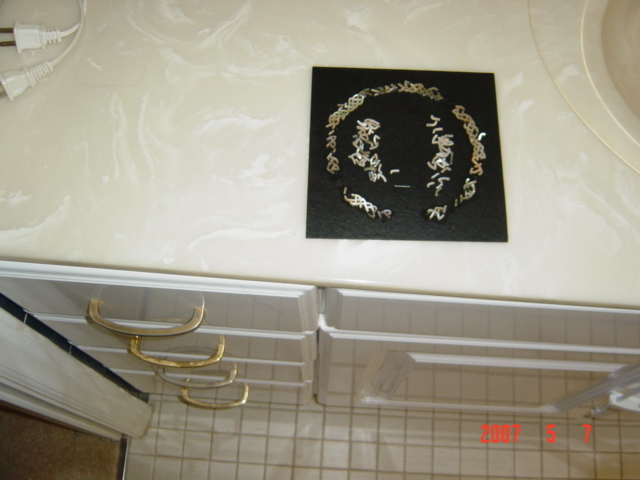 Now you should also look at many photos in our gallery to get ideas for inlays you may want to create yourself. Also getting some of the great videos and books that have been put out by folks like Larry Robinson and Grit Laskin will really inspire you to greater work. A little off the subject but useful to all of you. This is a link to a good tutorial on the art of french polishing by a guy who is quite good at it, Maybe just the best there ever was? 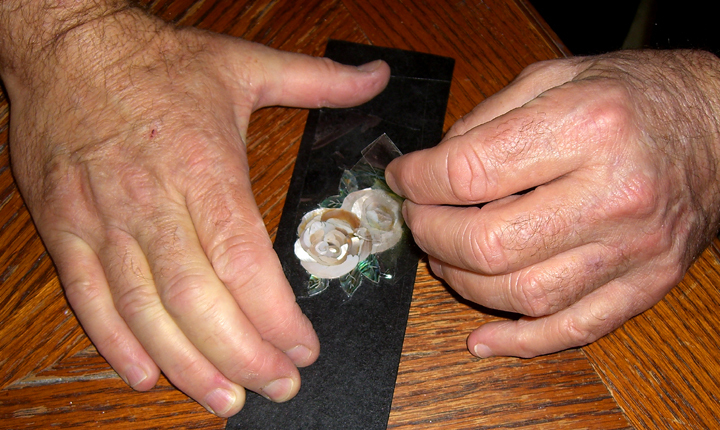 Here you will see some of our artists cutting and assembling inlays. 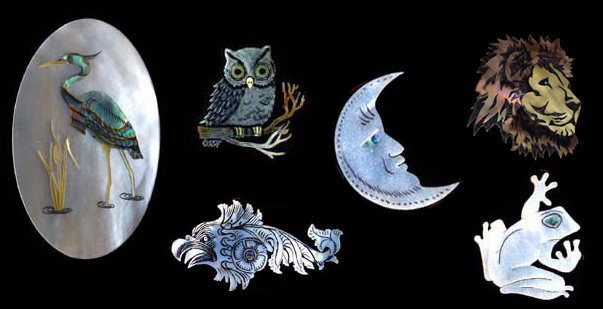 They can also be seen making their own homemade jeweler saw blades and tapping teeth into the blade blank with a knife edged steel. At the beginning of the movie you will also see my shop managers with me and two of my sons, Sam and Dominic.